I’m waiting to get back on track. I’m waiting to eat healthy. I’m waiting to be in control of my life. I have a lot of changes coming. My daughter is moving out of the house tomorrow. My wife moves out in a few weeks. There are plans in place to get ride of the house in Charlestown. I’ll be selling my truck before the end of the year. Nothing, but mentally I seem incapable of handling too much at once. So I’m waiting. Not a great reason, but it’ll have to do. My neck problem improved dramatically for a while, then started to get a little worse. I’m going to start commuting on the recumbent again for a while, and save riding upright bikes for group rides, or gravel stuff, or whatever. 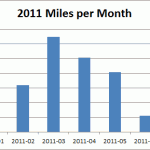 My June mileage was horrible. Due to my neck issues I rode only 110 miles. 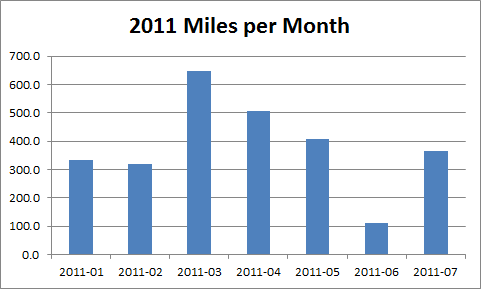 July was better, but still a bit off, at 363 miles. Back in March I rode 647 miles. I met up with Tim this morning for a short-ish ride. I ended up with 35 miles for the day. I was happy with that. I brought my camera with me, but never took a picture. I’ll be car-free by the end of the year. I will hopefully be back on track for weight loss. I should be weighing myself again soon. I will hopefully pull myself together enough mentally to be happy with what I have, rather than obsess with what I want. I’ll still want things, I just don’t want to obsess over them. One day, 640 miles, $120 in gas. I had a number of errands to run today, but since moving into town in September, I’ve been able to re-arrange my life to make using a car optional. Before work this morning I went to the post office to pick up a package that they would not leave at my door. Then I stopped by the bank before continuing on to work. After work, I had a massage appointment, then picked up dinner before heading home. Those new panniers came in quite handy for hauling things today. 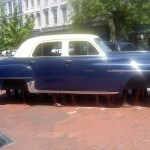 While running afternoon errands on Bardstown Road, I saw this Salsa Vaya parked. 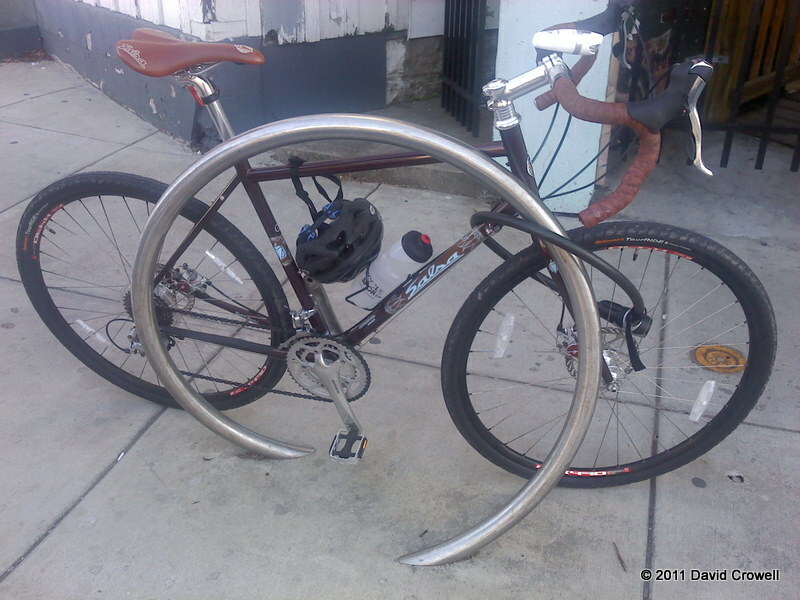 Time and I have discussed using a bike like this for a gravel bike. I don’t need a specific bike for gravel, but it is a nice bike. What was the package I picked up this morning? 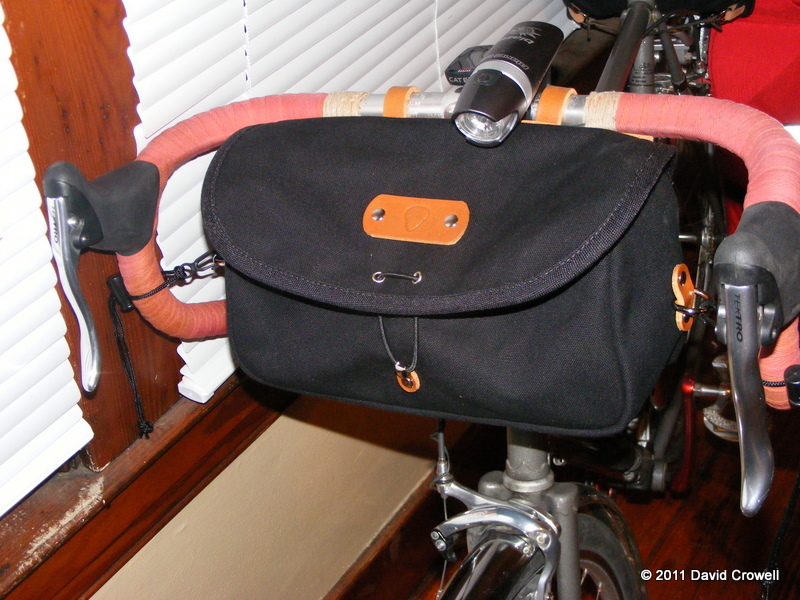 It was an Acorn Handlebar Bag. With this, I’ll have easy access to a few things while riding the bike. I’ve been envious of others pulling out their cameras on rides. I had to stop and fumble around in my trunk bag. That shouldn’t be an issue now. I have another bike project in the works for the LHT. Stay tuned, I’ll be posting about it next week. 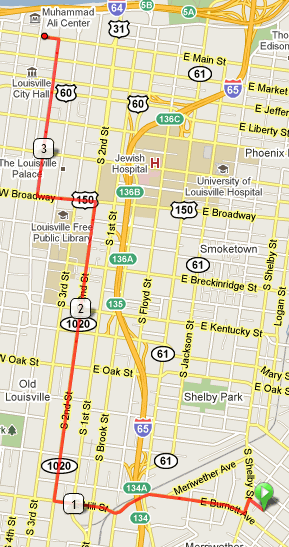 Bicycling for Louisville celebrated π (pi/pie) day today. They put on a fun little fundraiser. I brought in a peach pie that my wife baked last night. I’d never heard of cabbage pie until tonight, but it was good. There was a pretty good turnout considering the cold drizzle that came to area today. Bicycling for Louisville managed to pry a little money out of my wallet, and fill my stomach with pie. What’s not to love? Yes, I ate too much, but I’m skipping dinner. I’ll never get to be car-free. My wife requires a car. I still owe on my truck. I’m okay with the situation, although getting down to one vehicle would be nice. 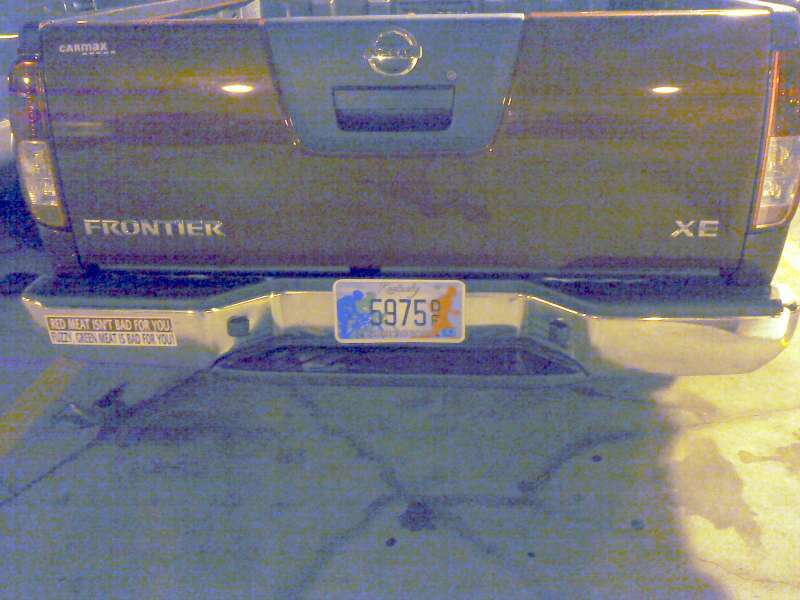 I rarely drive, but I’ve been driving with Indiana plates on my truck for months after moving to Kentucky. Part of it was laziness. Part of it was waiting to get the lienholder to send the title. 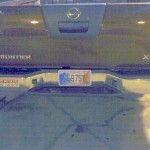 Today, I drove to work so I could take my truck in for the inspection, then to get a Kentucky license plate. I spent the extra money to get a Share the Road Plate. The extra money for the plate goes to the Paula Nye Memorial Education Grant program, which provides money for a number of bicycle education and safety causes. The biggest benefit to me is that when I’m driving, most cyclists will I’m keeping an eye out for them. 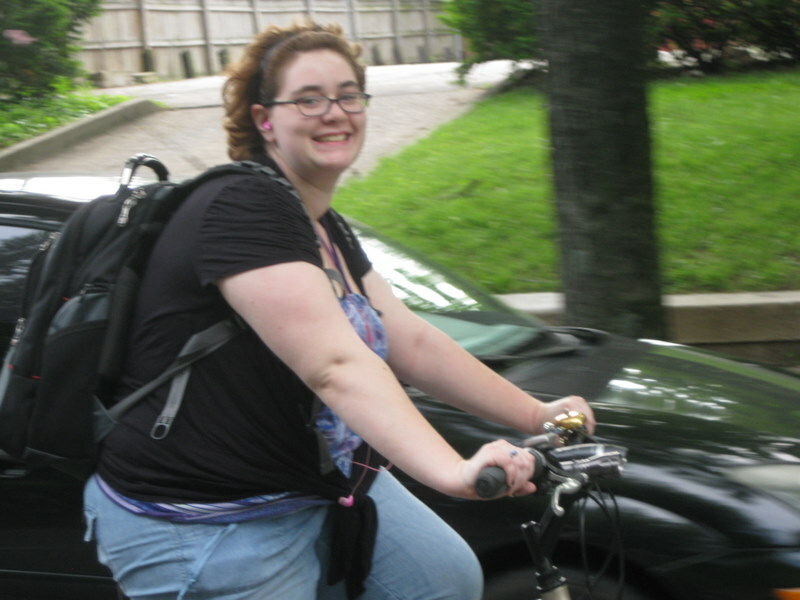 I raised over $2500 and completed the ride. I’ll call that success. I did not participate in 2010. The fundraising part really is the hardest. I gave up the unicycle. This was up and down for a while, but I moved to Louisville, and I ride (almost) every day. Hasn’t really happened, although the triathlon training should help that. I still haven’t touched a kayak, but I did take a canoe trip. 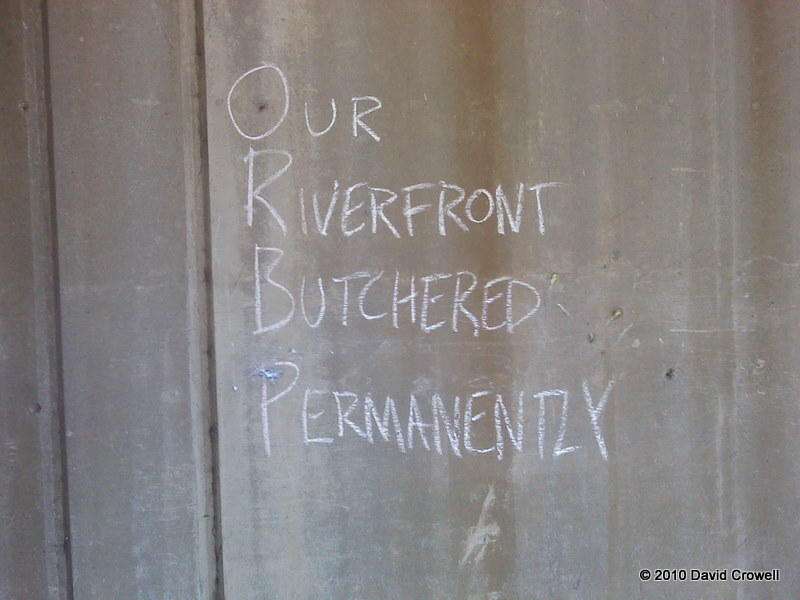 I didn’t do this either. Most of my free time is gone. I have been reading a lot though. I guess training for a triathlon counts. I’m also starting weight lifting. I wrote this when I had an old car that was paid for. Then it died. 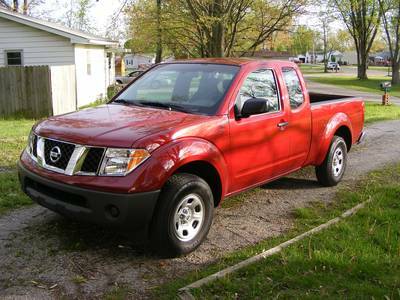 Then I bought a truck. I seldom drive now, but I’m now married, and have a car payment. It’ll be a while before I can become car-free. I did not make 5000 miles in 2009. I did in 2010, and hope to in 2011. I ride in cold rain. I still don’t care for it, other than the “crazy factor”. I’ve modified this to simply ride more than I drive. I didn’t get a chance for a real roller coaster, but I did ride in a number of other amusement park rides. Yes, I fit. Didn’t happen. I still want to do it someday, but I’ve got too much else going on financially and time-wise. I may be slightly better, but only slightly. I still don’t cook often enough. I did. I met her shortly after writing that blog post. This blog started as a way to document my weight loss and keep me accountable for my eating habits. Once I started bicycling that was simply added into the mix. More recently, the weight loss aspects have been ignored. I’ve gained some weight. I don’t weigh myself regularly anymore. Which vehicle to take to the coffee shop? This is, in part, due to my focus on bicycling for transportation. Bicycling for transportation has become such I big part of my life that moved into Louisville (while continuing to pay the mortgage on my old house) so that I could bicycle everywhere. It’s been wonderful. I have not driven to work since moving. When my wife and I go out to eat, I’ll even meet her there rather than drive (if she’ll let me). 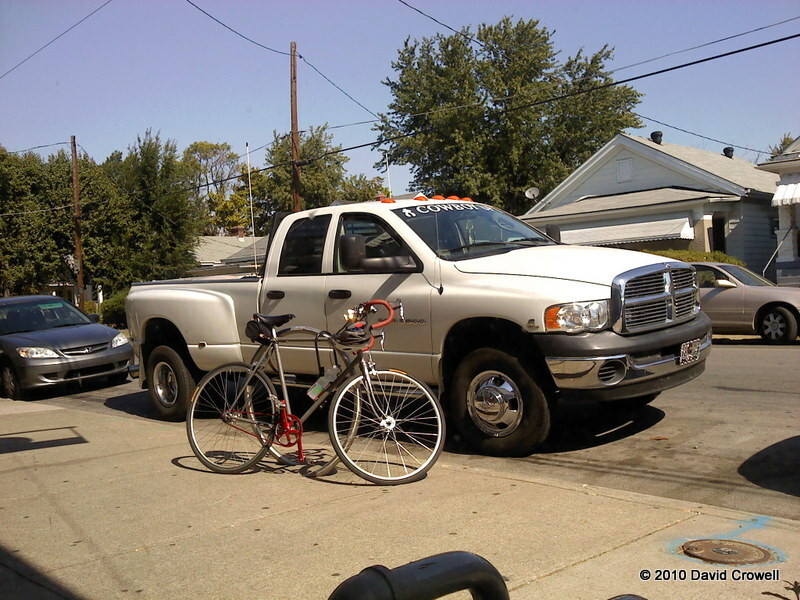 I rode my bike to the coffee shop the other day, when the white truck in the picture on the right pulled up. One individual drove that huge diesel-powered truck, just to grab some coffee. I have nothing against trucks. I own one. 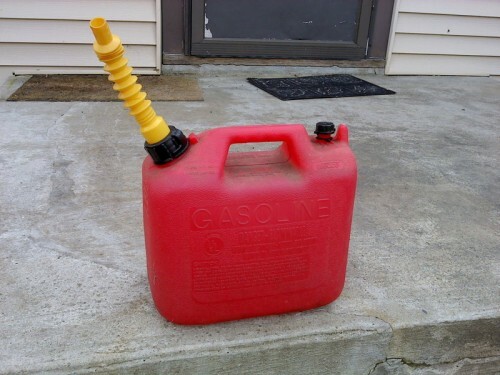 I just believe in using the right tool for the job. I’ve been very busy for the last week. Some of it has been the have-to-do stuff. Some of it is want-to-do. In either case it has left me sleep-deprived. I was up late last night driving to Danville and back. I had intended to ride the Harvest Homecoming ride today. I changed my mind at the last minute and went back to bed. I don’t regret the decision. I needed the sleep. 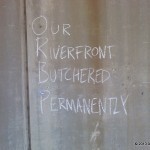 So, this blog… where does it go? What should I focus on? I would love to show some positive results in my weight loss and/or fitness. The truth is, I haven’t really improved either of those since February of 2009. I’m in much better shape than when I started in 2007, but I don’t think I’ll ever get to my goal weight of 175. Maybe this is where I need to focus on waist size and strength. I should add some weight training to the mix. So, I haven’t been writing about every bike ride recently. It’s safe to assume I ride every day now. I will continue to do so, except maybe today, where I probably won’t be leaving the house. I will write about exceptional rides. I will write about what I decide to use as a metric to measure my progress, but I need to figure that out still. 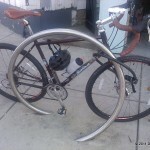 Posted on October 3, 2010 Categories Bikes, Car-Free, Exercise, Goals, Pictures1 Comment on Change of Focus? 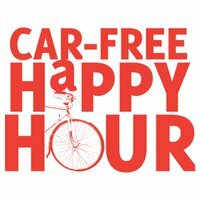 I attended last night’s car-free happy hour at The Monkey Wrench. This is a once a month get-together of those that are car-free, or want to be. There are guest speakers, but the coolest thing is the networking. This is the first one I’ve attended, and there were about 30 people there. The collection of bikes out front was quite interesting. unlike many rides I’ve been on, every bike at this event was set up for transportation and/or hauling things. I’m going to attend as many of these things as I can. The next one is 2/16/2010 @ 5:30 at The Bodega on Market Street. I really had intended on sticking out the car-free lifestyle for a while. After a discussion with Kristy about the future, and the realization that we will be in this house for a while, I decided to buy a vehicle. I bought a used 2008 Nissan Frontier. I’m back in the world of car payments and full-coverage insurance. 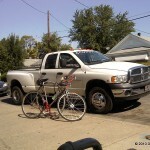 I really like the truck, and I’ll be able to haul my bikes, dogs, or whatever else I need to. I’ll still be riding the bike to work a few days a week. I don’t want to start gaining the weight back again. I rode my bike to work and back Monday, Tuesday, and Wednesday (with some bus assistance). I wimped out on Thursday, and called a co-worker for a ride. That co-worker was not able to give me a ride home, and I didn’t have my bike with me. I borrowed a car overnight to get home. I drove the car back to work on Friday, with my bike on the back. Friday afternoon was beautiful. The temperatures were in the 70s and the skies were sunny and clear. I had forgotten to bring my helmet, and I rode home in jeans and a t-shirt. The Second Street Bridge was closed, but I had a positive experience with the shuttle service to get me across the river, as did Tom. Normally Fridays are bad for rude drivers. Not this one. It wasn’t until after I got home that I realized it might be because I was wearing my Ride to Conquer Cancer t-shirt. I found myself smiling most of the way home. It was the best commuting ride I’ve had in many months. Earlier in the week I was dreading the ride. I considered going into debt to buy a car, just so I could get one now. I held out, and feel better about it all, and will be riding again next week. Today, I’m mostly sticking around the house to do yard work. I may make a grocery run on the bike. Tomorrow I have an RCCS ride, but I’ve arranged a ride to get there. 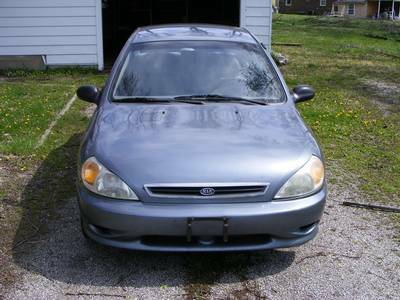 My poor Kia is out of service, possibly for good. The timing belt broke this morning and some pretty serious engine damage came out of it. I could repair or replace the engine, but the rest of the car isn’t worth it. The timing (no pun intended) of this was actually pretty good. Had it happened earlier in the morning, it could have meant Kristy missing her flight (I drove her to the airport). If it waited until this Sunday, I could have been stranded somewhere between here and Michigan. Although I’m looking around for a cheap replacement car, this could be a great opportunity to ride more. I normally drive to get dog food and cat litter because I get large quantities from 12 miles away. Today, I had to get a smaller bag of dog food of a different brand, so that I could get it here in town, and so I could haul it on my bike. 20 lbs of dog food and 14 lbs of cat litter definitely affected the handling of the bike, but I made it home safe.